One of the things that delighted me was how I was greeted by many of the core organizers of the conference with an ungngo. When I attended the first International Babaylan Conference in Sonoma California in April 2010 I did not know what to expect. I had come due to the encouragement of my friend Virgil Mayor Apostol who told me of the good experiences he had with the core group of the Center for Babaylan Studies. Virgil was to be a keynote speaker. He encouraged me to submit a proposal to speak in one of the workshops about the spiritual symbolism of traditional Filipino tattooing since I was releasing a book on the subject in the Fall of 2010. So I submitted the proposal and was given a time block to present my topic. When I arrived with Virgil at Sonoma State University I was pleasantly surprised at the positive energy and spirituality that was embraced by the both the attendees and presenters. One of the things that delighted me was how I was greeted by many of the core organizers of the conference with an ungngo. This traditional greeting used anciently throughout much of the Philippines and the Pacific Islands was performed by placing one's nose to the side of another's face and inhaling. An alternative way of performing the greeting was to press noses and inhale together. “Ungngo” is an Ilokano term and other ethnic groups in the Philippines called it by other names. I learned that at previous events, Virgil had taught the core group of organizers for the conference to perform the ungngo. In the past Virgil and I had discussed the ungngo and its declining practice in the Philippines. Consequently it was so gratifying to see it practiced at the conference. As the conference progressed the practice of the ungngo began catching on with other participants as well. In an effort to help others understand the deep meaning behind the ungngo I want to share what I have learned about our traditional form of greeting. My earliest recollection of the ungngo was from my inang baket (grandmother) Catalina Coloma Rivera who was a traditional mangngilut or midwife and healer. When I was a young boy living in California, my grandparents would occasionally visit us from the Philippines. The moment my grandmother walked through the door, she would immediately grab my head and press her nose to my cheek and “smell” me on both cheeks. This behavior confused me as a small boy, having grown up in America. I often wondered, “Do Americans just smell really good or something?” But as I grew older I just accepted it as her way of showing her affection. Years later my grandmother's greeting became so much more meaningful to me. About fifteen years later when I was living in Hawai'i, I was visiting some friends in Keaukaha on the big island of Hawai’i. On one occasion I had a Hawaiian woman teach me about the true meaning of the Hawaiian word “aloha.” She told me that before the Europeans came to Hawaii, the Hawaiian people would greet each other by touching the sides of their noses to the cheek of the other person, inhale and say “Aloha.” She explained that most people believe that Aloha means “hello” or “love” but few know its true meaning. Aloha’s meaning is derived from “alo” which means “to go with, to share or to follow” and “ha,” which is “the breath of life” or figuratively the “essence of the soul.” She told me that this word and greeting was an intimate expression among friends, a sharing of spirits. In effect it meant that a portion of my spirit will follow after you. Catalina Ford gives her mother Mildred Coloma (Rivera) Wilcken an ungngo. When this woman taught me all of this, I had a flashback to my childhood memories of my inang-bakut smelling my cheeks! I asked my mom about it. She explained to me that this action was called in Ilokano, “ungngo” (pronounced: “Ong-ngoh” with stress on the “ng” sound) and was only practiced by the older people now. I asked her if there was any meaning attached to it. My mother stated, “I don’t know if there is. That’s was just our way. 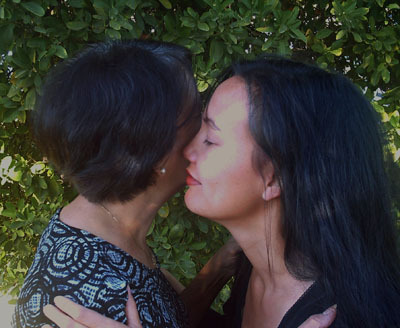 The younger people now kiss on the cheeks like the Europeans instead.” Presently the word ungngo has come to mean “kiss.” But it was through this experience in Hawai'i that I gained a greater appreciation for my old grandmother's practice of the ungngo. Now I remember my grandmother's greeting with a love and an intimacy that I never understood before. She was sharing her soul with mine. My inang baket has passed away but I have since continued this tradition with my own children. When my daughter Brenna was born I greeted that beautiful baby girl by sharing the breath of life with her. Each of my children has been lovingly greeted the same way at birth and we continue to practice it in our home. Today you will probably not see anyone in Hawaii practicing the traditional way of greeting in “Aloha” but you will see a lot of people kissing each other on the cheek. The same is true in the Philippines, people will kiss each other on the cheek but the traditional greeting is usually only practiced by the elders. The kiss on the cheek is an adopted European expression which approximated the traditional greeting. 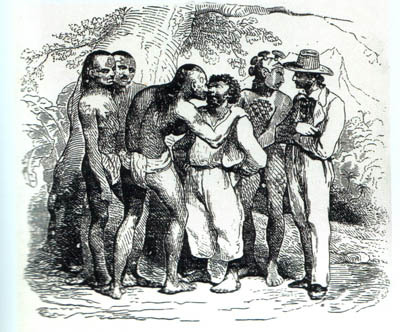 The Hawaiian word for “kiss” is “honi” (hoh-nee) which is described in Hawaiian dictionaries as “the former greeting, to touch noses on the side in greeting, to smell or sniff” as well as the modern use of the word as “kiss.” It appears that at some point the meaning behind the ungngo was lost but the practice remained. The Hawaiians, at the time I was told of this, did not actively practice it in public but still remembered the meaning behind this tradition. The act itself was called “honi” but the meaning behind it was “aloha.” Currently there is a revival among Hawaiians to “honi” the traditional way especially among practitioners of the ancient style of hula (hula kahiko). According to my friend Virgil Apostol, author of Way of the Ancient Healer, there is also a scientific aspect to the practice of the ungngo. Although largely ignored and masked with perfumes and colognes, humans do have specific and individual scents and also produce pheromones (airborne hormones). Virgil states that “these scents enable animals, including humans to chemically communicate.” Virgil gives an example of how a young toddler cries when missing his mother but is comforted when given a piece of his mother’s clothing saturated with her scent. Many midwives have told me that it is important for a newborn to be given immediately to the mother after birth so that the baby will bond with the mother by knowing her smell. This is because a newborn’s sense of sight is not well developed at birth. It is a form of imprinting. From many mothers I have heard how they love the way a newborn baby smells. Many people have also noticed how smells will also trigger memories. In this light the ungngo is a very intimate form of bonding between family members from parents to the children. To ungngo or honi a person outside of your kinship group is like bringing them into that intimate circle of family. In New Zealand the Maori people still practice a similar traditional greeting where two people will press their noses together. It is performed by first pressing one's nose on one side of the nose of another and then on the other side or simply by pressing noses together and inhaling. Sometimes the Maoris make a “Mmmm” sound along with the pressing of noses. This greeting is called by the Maori the “hongi.” (hoh-ngee) The word “honi” in Hawaiian is very similar to the Maori word “hongi” which in turn is similar to the Ilokano word “ungngo” if you drop the “h” in “hongi” which is not used in Ilokano. (oh-ngee = ong-ngo) Among some districts in New Zealand, certain tribes of the Maori do not aspirate the “h” sound and so the word “hongi” would actually be pronounced, “oh-ngee.” According to Sua Suluape’ Petelo, a master tattoo artist and chief in Samoa, the same practice in Samoa is called the “sogi” (pronounced: soh-ngee). Many of the words used for “kiss” in modern times may have originally been the words to describe this ancient practice. Words for “kiss” like “halok” or “halik” in Cebuano and Tagalog or “haluk” in Hiligaynon could be ancient Philippine cognates of the word “alo” (to go) in “aloha.” (hALOk = ALOha) The Cebuano word “adto” (go) is a cognate of the Hawaiian “alo.” The word halik may have also been derived from “hali ka” as a contraction. Halik may have been an invitation to come [together]. This interpretation would be similar conceptually to go with another person as in aloha. There are many beautiful traditions from our past that have been abandoned by recent generations because they seem strange when seen through the eyes of western civilization. Some of these traditions have become so faded with time that only fragments of these traditions remain. I was so pleased by the practice of the ungngo among the participants of the Babaylan Conference. I had anticipated sharing my soul through my lecture, but to actively practice the ungngo, I felt embraced and accepted into the hearts and souls of many new friends, brothers and sisters. Our traditional greeting is such a precious tradition which should be cherished and lovingly practiced. It is a cultural marker of the peoples of the Pacific Islands and the Philippines showing our shared heritage. In the spiritually symbolic sharing of the breath of life, the sharing is not limited to the two individuals greeting but also conveys an exchange of spirit with all the other people who had touched or contributed to the individual's life and spirit. This would include the long chains of ancestors whose breath lives on in their descendants and ultimately the breath of life from the Creator. I feel that the ungngo is a deeply powerful metaphor for the first International Babaylan Conference, a sharing of souls from throughout the world and across the expanse of time. Until we meet again in the body, let the spirit we shared with one another continue with us to inspire us in every breath we take. 5. Scott, William, Henry. Barangay: Sixteenth Century Philippine Culture and Society, 1995. Quezon City, Philippines. Ateno De Manila University Press.